The object of this week’s article is to celebrate the most underappreciated and arguably one of the best burn spells in magic. Forked Bolt. On the surface, we look at this spell and think, it’s a simple 2-for-1 (potentially) that makes up half of a Fire//Ice, but kicks around at sorcery speed, which is a big turn off for a lot of players. However when it comes down to it, the mana cost of one is more than worth playing at sorcery speed. Well, in standard, we all know to run Gut Shot since there’s a lot of one toughness guys that need to get eaten up. It turns out that in Modern and Legacy, this is just as true, and in fact there are more of them! In Legacy, we’ve all seen people jam a few into the RUG Delver decks, Samuele Estratti ran two in his top 32 finish at GP Ghent recently; so it’s not an uncommon sight. But why? Some people take the flexibility of Fire//Ice instead, this however is a mistake. The RUG Delver deck is very much tempo based and needs it’s spells to cost as little as possible, when an opponent drops a Thalia, Guardian of Thraben on turn two; and you are stuck on two mana, which is all the mana you want to see; then Forked bolt can win you the game when Fire//Ice could not. Being able to take out an early Noble Hierarch and/or Dryad Arbor can ruin another deck’s tempo, which is obviously key with the deck. Yes, you can tap down a blocker with Fire//Ice, but it often means tapping out, or is too late; or is perhaps not allowing you to make the extra pressure you need on the same turn, whereas the Forked Bolt allows you to beat other people’s Tarmogoyf in combat and gain an additional point of damage to distribute at a very low cost. Forked Bolt is the key card in some match ups like Elfball, which is currently being popularised by Caleb Durward, and can take out double Delver of Secrets early on in the mirror, or just take out one if it’s flipped, but having that window of extra value is key. This card shines even more. There’s a multitude of targets, Dark Confidant, Signal Pest, Memnite, Noble Hierarch, Birds of Paradise, Vault Skirge, Vendillion Clique, Snapcaster Mage, Spellstutter Sprite, Grim Lavamancer and the list goes on. 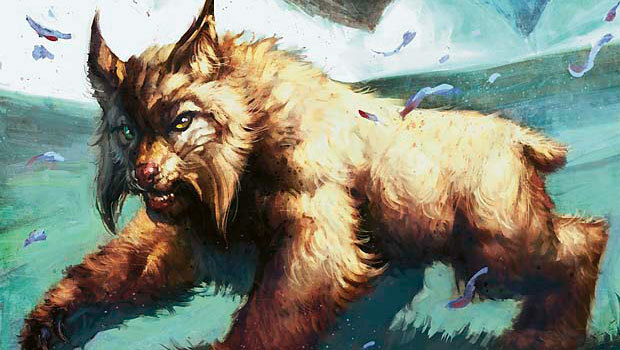 But against the hugely popular WUR Tempo deck, it’s even more valuable since they run both Delver of Secrets and Steppe Lynx, and since the deck applies a lot of pressure from the off, it’s very easy to hit two of these guys early on. Steppe Lynx is also a card you want to be hitting in your turn most of the time since otherwise they can pump it, so you can at least use the Forked Bolt to force them to waste a fetch land and pump it for no value whilst nailing something else, the WUR deck pretty much only has Geist of Saint Traft who doesn’t die to Forked Bolt. Against the Naya Birthing Pod deck, it’s crucial to zap away multiple mana dorks and this is the perfect card to do it, with so many targets all across the field, people should be splitting their Lightning Bolt and other burn spells up with these bad boys. There we are really, thought I’d spend some time singing the praises of what in my opinion is one of the best burn spells in all of Magic at the moment, so next time you’re sleeving up some red sources outside of standard, spare a thought for this beast of a card and do the right thing. The preceding was a public service announcement on behalf of the Forked Bolt party.